If you're in the mood for nutritious vegan lasagna that's unique and presents beautifully at dinner parties, you're in luck. 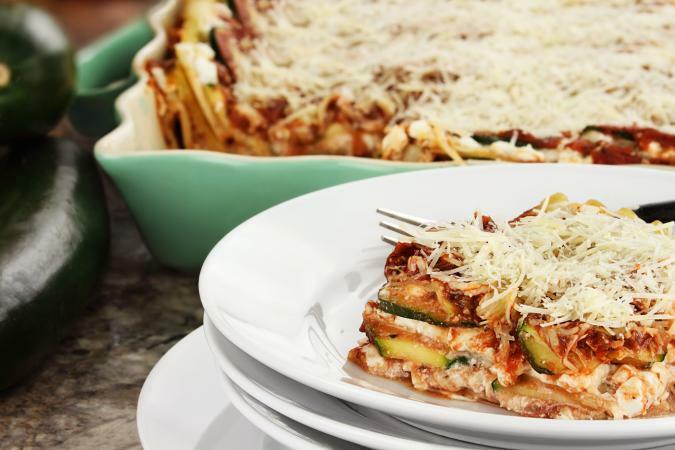 You don't have to sacrifice taste when choosing this plant-based zucchini lasagna recipe with a delicious homemade vegan ricotta cheese filling. Use the following vegan ingredients to prepare this delicious lasagna recipe. First prepare the vegan ricotta filling -- then begin making your lasagna. Heat oil in a skillet over medium-high heat; then add in onion and garlic. Sautee mixture until onions begin to brown. Add tofu, onion mixture, and remaining ricotta ingredients to a food processor; blend the mixture until smooth and creamy. Drizzle olive oil into a 9 X 13 pan. Layer the rest of the ingredients in the following order (tomato sauce, noodles, ricotta, zucchini -- tomato sauce, noodles, ricotta, zucchini -- tomato sauce, noodles, ricotta and zucchini (as illustrated in the photo). Bake uncovered for another 20 minutes, or until zucchini is tender. Let the lasagna rest for 10 minutes, and serve! Layer an additional 1 cup of vegan cheese inside the lasagna. Use store-bought vegan ricotta (instead of homemade) if you're tight on time. Use whole-grain noodles instead of brown rice noodles. Layer in meatless vegan crumbles as an optional variation. It's simple to substitute plant-based foods for meat and cheese when making vegan lasagna and other Italian dishes, and many of these foods taste just as delicious as the real thing!